Simon Denny's inaugural exhibition at Friedrich Petzel Gallery shares its title with a trade magazine. Published from 1988 to 1990, in the wake of the market crash, “Corporate Video Decisions” was distributed to video departments within corporations, who were responsible for making videos with the intention of both boosting internal morale and managing their public image. This magazine serves as the content for different media transpositions, which result in different types of hybrid objects. 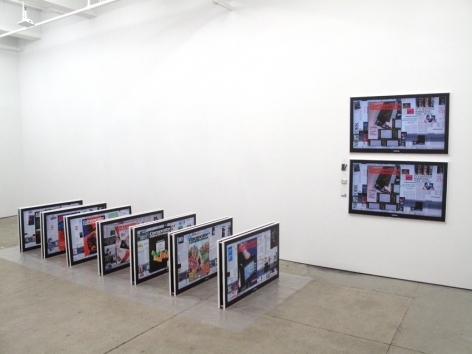 One side of the gallery wall is lined with a scatter of canvas-reliefs printed with photographs of digital collages displaying selected issues of the magazine. Each work includes two canvases printed with the same image, superimposed with spacer bars. Emphasizing the effects of remediation, the moire pattern on the surface of the photograph, a result of submitting the screen to photographic reproduction, resonates with the weave of the canvas. Denny has also worked with a professional corporate DVD designer to produce a 3-D graphic interface for a digital archive of “Corporate Video Decisions,” which is navigable in a manner comparable to an iTunes library. This archive has been loaded onto the same Samsung monitors which were photographed to create the canvas-reliefs. 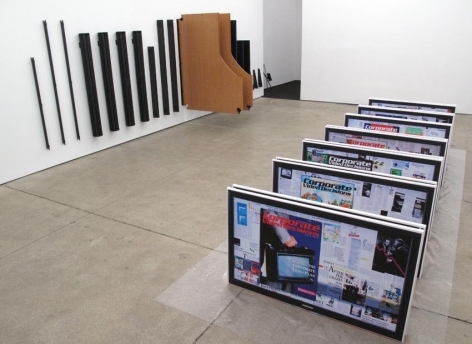 Facing these two series of works is a large trading table, imported from a decommissioned office in Germany, disassembled into its constitutive parts and arranged vertically in a manner suggesting a bar graph. In the rear office space of the gallery, Denny has materialized the website of Diligent Board Portals, a successful designer of paperless presentation software for boardrooms. Each section “header” of the website (Home, About Us, Diligent Boardbooks, Security, Global Support, Clients, Investors, In the News, Demo, Corporate, Windows) has been translated onto canvas and encased in plexiglas boxes, protruding from the walls like signs. All content (text, images, and downloadable PDFs) are packaged in plastic bags. The inert, packaged quality of these objects contrasts with the interactive structure of both the immaterial online pages and the software sold by Diligent Board Portals. If the magazine “Corporate Video Decisions” provides a snapshot of commercial video culture around the economic slump of the late 1980s, the website of Diligent Board Portals is a piece of ephemera which fulfills a similar function with respect to the present. 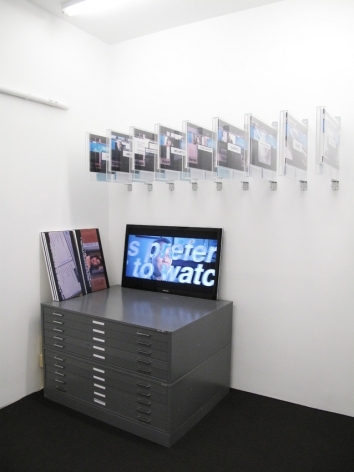 Friedrich Petzel Gallery is located at 537 West 22nd Street New York, NY 10011. Gallery hours are Tuesday through Saturday from 10:00 AM – 6:00 PM. For further information, please contact the gallery at info@petzel.com, or call (212) 680-9467.